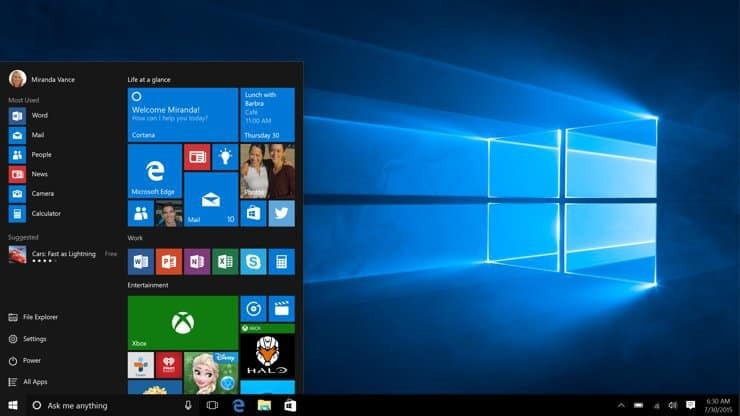 With the introduction of Windows 10, Microsoft promised more stability and better support for all users. 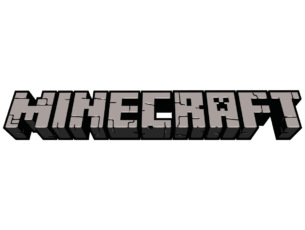 Since 2015, the company has stayed up to the task. At least, most of the time. However, frequent updates occasionally have their own issues. 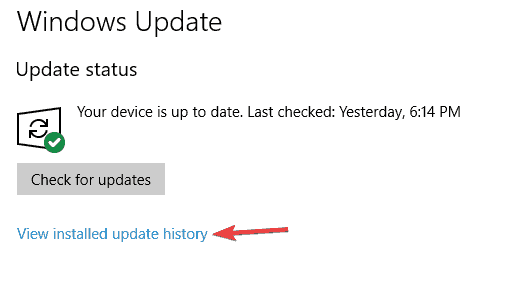 Namely, some mandatory updates are provoking various problems. The update error code 0x80072af9 is just one of them. This update’s purpose is to improve the overall security in Microsoft Office. However, as the case proved, it can have the reverse impact on the system. It is a known culprit for crashes of Office programs, and system drags. Today, we’ll try and help you resolve this issue. Microsoft error code 0x80072af9 – If this error occurs on your PC, be sure to check your antivirus. Your antivirus can interfere with your system and cause this and other errors to appear, so you might need to disable it. 0x80072af9 Windows Store – This error can sometimes appear while trying to use Windows Store. If that happens, be sure to check your system using SFC and DISM scans. 0x80072af9 Outlook – A couple of users reported this problem while using Outlook. If you have the same problem, we advise you to reinstall Microsoft Office and check if that solves your issue. 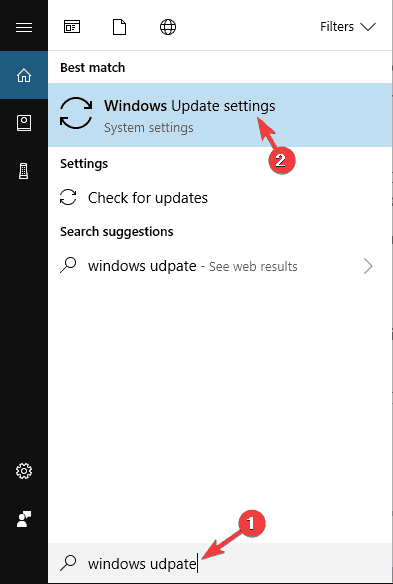 Update error 0x80072af9 Windows 10, 7 – According to users, this issue can appear on any version of Windows, and older versions aren’t an exception. Most of our solutions are universal, so you can apply them to Windows 7 and 8 alike. Using a good antivirus is important if you want to protect your PC from online threats. However, your antivirus can sometimes interfere with your system and cause 0x80072af9 error to appear. To fix this problem, it’s advised to disable certain antivirus features and check if that helps. If the issue is still present, you might have to disable your antivirus entirely. In worst case scenario, your only solution might be to remove your antivirus. If removing the antivirus solves the problem, you should consider switching to a different antivirus such as Bitdefender. This antivirus offers great features, and it won’t interfere with your system in any way, so feel free to try it out. Open Search Windows and type Windows Update. If there are some updates available, the system will install them after Active hours. Have in mind that this will work only if there are no corrupted system files. If the problem persists, move on to a next step. As we all know, updates are installed and stored on the system partition. Moreover, possible malware infection thrives on playing with those essential files. So, the files can get corrupted or deleted. As the matter of fact, they start working against you. So, we should check them out. Press Windows Key + X to open Win + X menu. 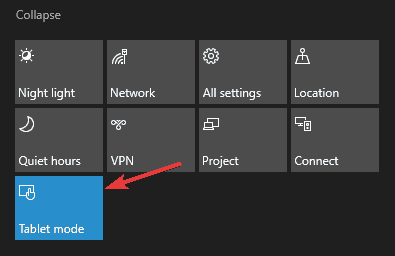 Now select Command Prompt (Admin) or PowerShell (Admin) from the list. Now enter sfc /scannow and press Enter. SFC scan will now start. This scan can take about 15 minutes, so don’t interrupt it. If you are unable to run SFC scan, or if the SFC scan didn’t fix your problem, you need to use DISM scan instead. To do that, start Command Prompt as administrator and run DISM /Online /Cleanup-Image /RestoreHealth command. DISM scan might take 20 minutes or more, so don’t interfere with it. Once the scan is finished, check if the problem is resolved. If the issue is still present, repeat the SFC scan again to fix the problem. 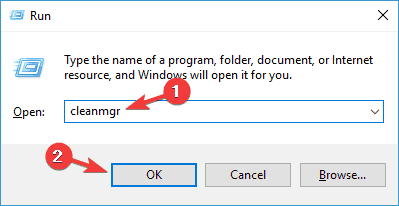 Open Search Windows or press Windows key + R.
Type cleanmgr (or Disk Cleanup) and open tool. Choose system partition (most of the time C:). 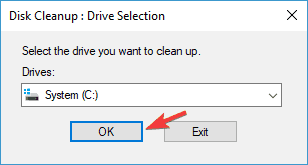 The process will clean junk files. There are also many great third-party tools that can clean unnecessary files. If you’re looking for a good third-party tool to clean your files, you might want to consider CCleaner. This tool is incredibly simple to use, so you should be able to remove unwanted files with ease. In Search Windows type Windows Update. Find the update related to Microsoft Office. That should be that. Restart your PC and check Office behavior after the update file is uninstalled. At the end, since this error is related to Office and its apps, you can try and reinstall the whole package. It will cost you some time and nerves, but, it will fix even the most relentless issues. 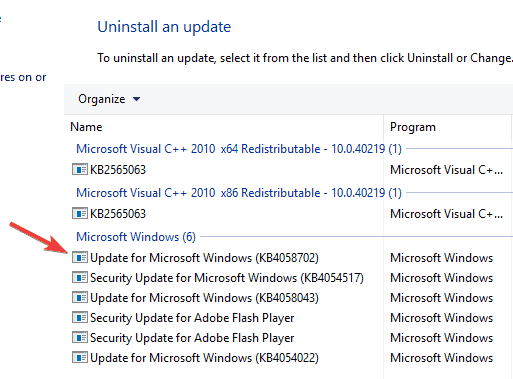 There are several ways to uninstall an application, but the best method is to use an uninstaller software. 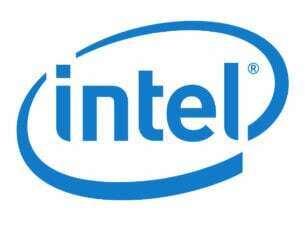 In case you’re not familiar, uninstaller software is a special application that will remove the selected application along with all its associated files and registry entries. By using an uninstaller software, you’ll completely remove the application and it will be as if the application was never installed. There are many great uninstaller applications on the market, but IOBit Uninstaller offers the most features, so you might want to try it out. Once you remove Office with this tool, install it again and check if the problem is resolved. Windows 10 comes with a useful feature called Tablet mode. 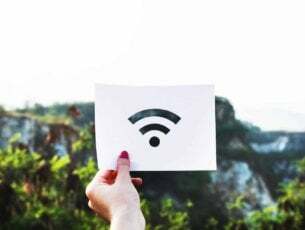 As you can probably guess, this feature is meant for tablets, and once you enable it, it will optimize your user interface for touchscreen devices. However, sometimes this feature can interfere with your system, and according to users, it can even cause error 0x80072af9 to appear. Open the Action Center. You can do that by clicking the Action Center icon on your Taskbar or by using Windows Key + A key shortcut. If Tablet mode is enabled, click it to disable it. Once this feature is disabled, check if the problem is resolved. 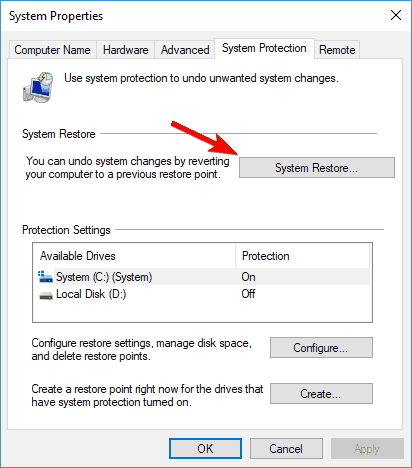 Press Windows Key + S and enter system restore. 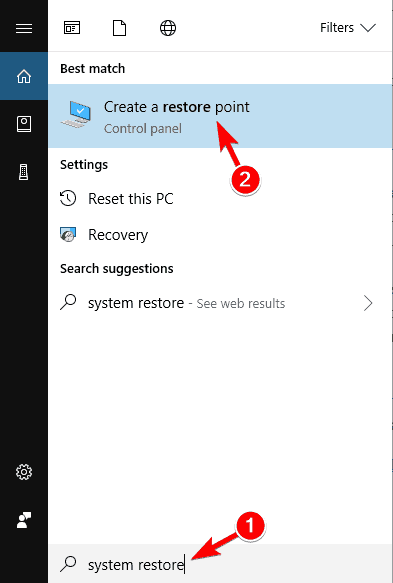 Choose Create a restore point from the list of results. System Properties window will appear. 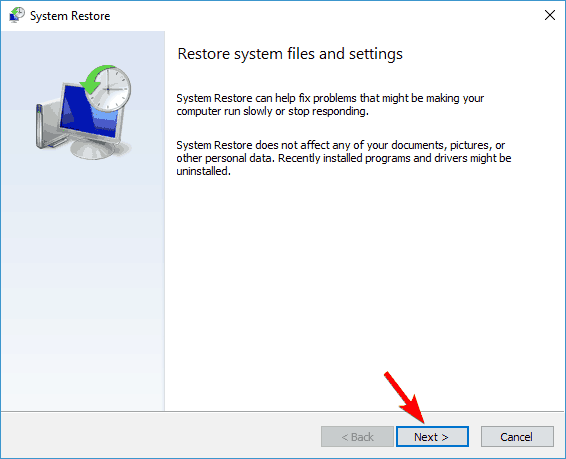 Click System Restore button. If available, check Show more restore points. Select the desired restore point and click Next. Follow instructions on the screen to complete the restoration process. After you restore your PC, check if the error code 0x80072af9 still appears. 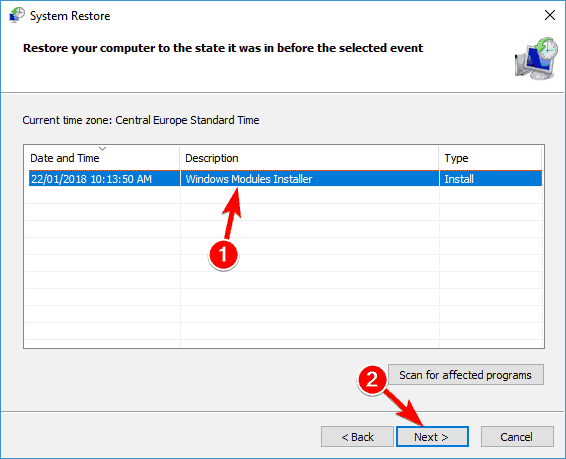 These were our solutions for Windows 10 update error 0x80072af9. We certainly hope you managed to resolve them. In addition, if you are having any doubts or questions, be sure to share them in the comments section below.